Chevy Cats basicly was a pure Rockabilly Swing Trio like in the mid 1950ties using vintage equipment like instruments, amplifiers and microphones on stage. We did like to make every gig a big party with a wink to the 1950ties rock’n’roll. 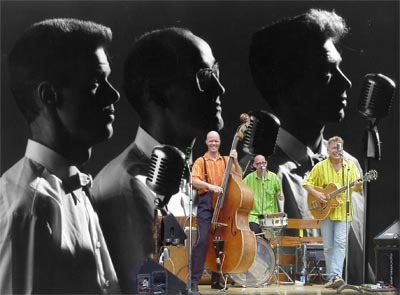 Beside our own music we were inspirated by Western Swing (Sid King and the five Strings) Rockabilly (Johnny Burnette and the rock’n’roll trio) and uptempo SUN artists like Sonny Burgess, Carl Perkins, Elvis Presley etc. If you have any nice pictures or video of the Chevy Cats please contact us or send it to "webmaster Chevy Cats" so we can place it on this site.